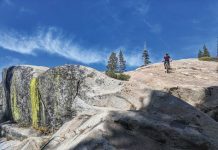 If you’ve ever researched hiking or biking trails in North Lake Tahoe, it’s likely you’ve come across the Marlette Flume Trail. The well-documented trail stretches along the East Shore offering some of the most awe-inspiring views of the lake earning a place as one of the must-hike trails in the area. 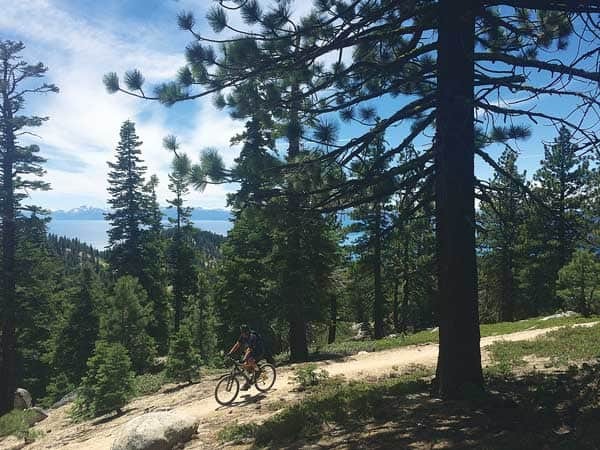 Phil Sheridan pedals the Incline Flume Trail with Lake Tahoe peeking through the trees. But what about the other flume trail? 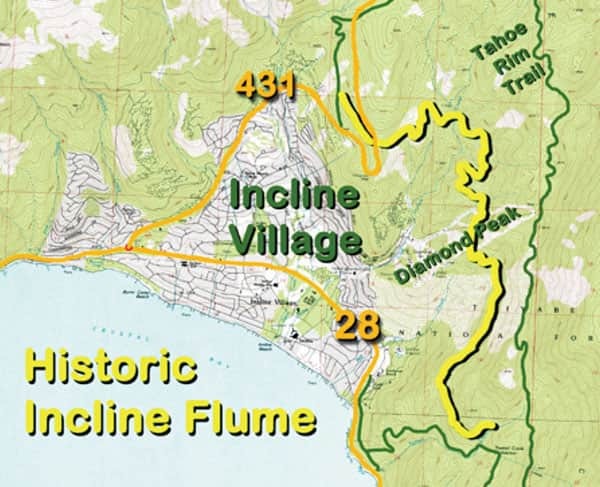 Like it’s similarly named counterpart, the Incline Flume Trail traces the route of another historic logging flume and offers a scenic route for hikers and bikers. Sometimes referred to as the “secret” flume trail, this 7-mile single track is a user-created trail not found on any maps. 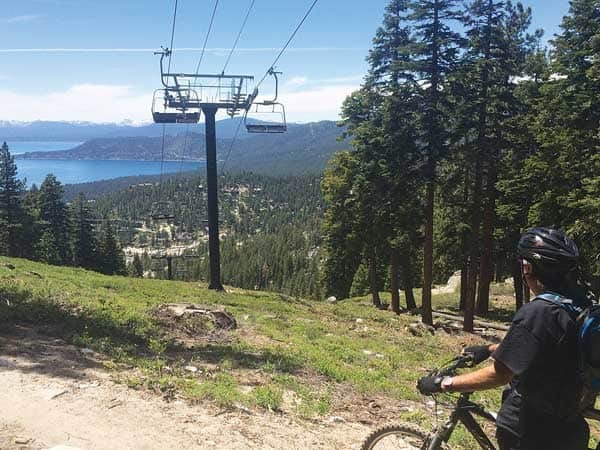 However, like many of Tahoe’s best secrets, the packed parking lot at the trailhead on a typical Saturday reveals that the Incline Flume is hardly a secret at all. Anyone seeking more information on the trail would only have to do a quick search online for directions. Starting from Mount Rose Highway it winds though Diamond Peak Ski Area and down to Tunnel Creek where it connects to many other trails including the Marlette Flume Trail. 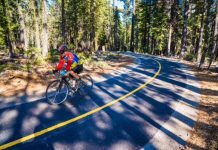 The limited elevation change offers a scenic hike or bike ride for a variety of recreational users. The trail descends through thick pine forests and crosses a series of small creeks and waterfalls. Bikers and hikers enjoy open views of Lake Tahoe as the trail winds through the ski area just before hitting the no trespassing signs. Until recently, this section of private land is what has prevented the Incline Flume from being designated by an official trail by the U.S. Forest Service. Without a designation, the trail is not officially maintained or improved despite heavy use from hikers and bikers. The land is part of the 550-acre Ponderosa Ranch where the show “Bonanza” was filmed. It also houses the remains of the only bull wheel ever used in logging history. The bull wheel was part of a historic tram for which Incline Village is named. The tram hauled thousands of pounds of lumber from the lake to be used as framework for mining tunnels. Recognizing the need to protect this important historic artifact and open the land to recreational use, local advocacy groups including The Nevada Land Trust and Friends of Incline Trails have worked for several years on a deal to make the land available to the public. Phil Sheridan stops to gaze at the lake under the Crystal Ridge Chair at Diamond Peak. 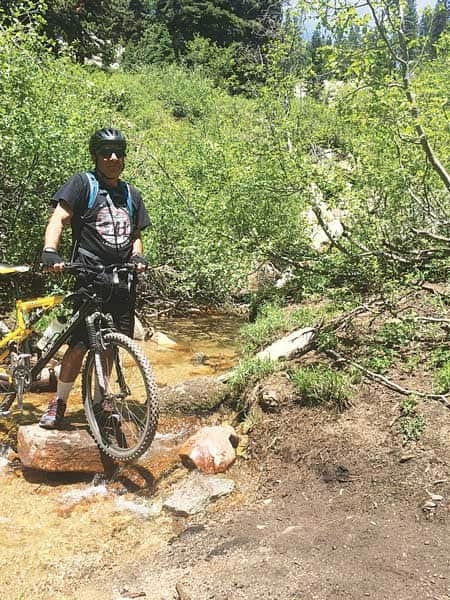 “The Land Trust has been the linchpin in working to make the trail official so we can maintain and improve the existing trail,” said Sue Hughes of Friends of Incline Trails. In March, the groups reached a critical benchmark when property owners Cheryl and David Duffield agreed to donate the 18.6-acre piece of land to the Nevada Land Trust. However, the work to make the land public isn’t finished yet. The property is still considered private, but the Nevada Land Trust is completing the process to transfer the land to the USFS, which already owns the adjacent land excluding the Diamond Peak Property. “We are grateful to Cheryl and David Duffield for their very generous donation of this important part of Nevada’s past and a vital link in the trail system. 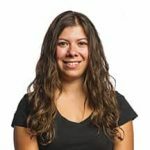 We’ll realign and restore this section of trail to better protect the historic area and the natural environment to prepare for public use,” said Alicia Reban, Nevada Land Trust executive director in a statement. Along with Friends of Incline Trails, the Nevada Land Trust will work to relocate a one-third mile section of the trail away from the bull wheel structure to help preserve the area while still allowing the public to view it. Additionally, they plan to widen the trail and control the erosion. The work is expected to be completed by summer of 2017, in the meantime the section of property is still considered private. 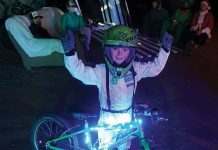 For more information on future construction and how you can help, visit inclinetrails.org.